Now Thomas, one of the twelve, who is called Didymus, was not with them when Jesus came. The other disciples therefore said to him: We have seen the Lord. But he said to them: Except I shall see in his hands the print of the nails, and put my finger into the place of the nails, and put my hand into his side, I will not believe. And after eight days again his disciples were within, and Thomas with them. Jesus cometh, the doors being shut, and stood in the midst, and said: Peace be to you. 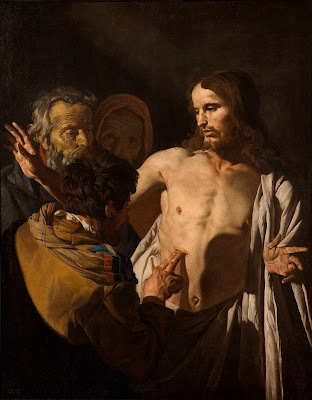 Then he saith to Thomas: Put in thy finger hither, and see my hands; and bring hither thy hand, and put it into my side; and be not faithless, but believing. Thomas answered, and said to him: My Lord, and my God. Jesus saith to him: Because thou hast seen me, Thomas, thou hast believed: blessed are they that have not seen, and have believed. The Incredulity of St Thomas, by Mattias Stom, 1641-49 ca.